Produce content that engages your audience and creates value. See that it meets these criteria. 00:08 – Does your content entertain? Does your content entertain? [Click To Tweet]. 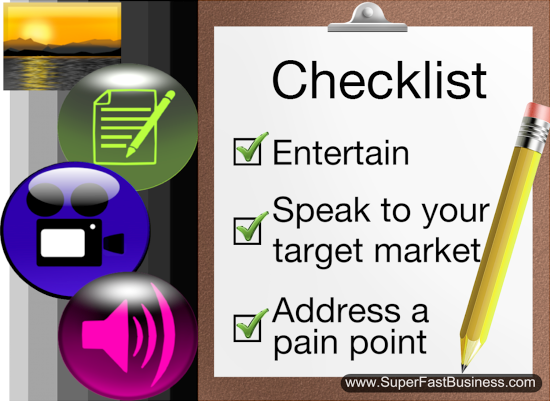 Speak directly to your target market. [Click To Tweet]. Target pain points. [Click To Tweet]. James Schramko here with three things you can do when you’re looking at your content to determine if it’s useful or not. Some of these findings come from a HubSpot report that had a look at Inbound Marketing for 2013. Here are three things that you really need to check when it comes to your own marketing. One: does your content entertain? You might have noticed some of my videos I’ve made from all different places around the world, whether it’s in Europe, or Dominican Republic, or America. Wherever I am, I take a camera, because people like to be entertained, and it’s interesting to see whereabouts I am in each video. Right now, I’m back at Manly, where I live most of the time. But entertaining your customers keeps them engaged. It’s interesting, it’s relevant. And part of what I talk about is how you can run a business from anywhere in the world, so it ties in with exactly my topic. And it’s relevant to my audience, and they get inspired by it. In fact, one of the biggest questions I get asked is what camera am I using, what microphone am I using, and how do I manage to make all of those videos while I’m out and about? So these are topics that my audience are interested in. What topics are your audience interested in, and how can you entertain them? Does It Speak To Your Market? Secondly is make sure that you are speaking directly to your target market. A big mistake that I see people make is they might be in a specific industry, and then they start making content that actually educates their competitor, or people who are learning to do what it is that they do, rather than solving the issues that the actual customers have. So remember who your target audience is. Again in my case, my audience are people who have an online business, who want to know more about websites, traffic, conversions and having a remote business, running a team, making lots of profit, perhaps quitting a job. These are all topics that my audience are interested in, so I make topics that relate to that. Of course, everyone watching this video should be blogging and communicating to their audience, so this sort of discussion’s highly relevant. Creating amazing content is highly relevant, especially post-Panda, post-Penguin, SEO era. The third thing to check is make sure you’re really addressing a pain point. What problems and challenges are your audience facing? What is the biggest concern they have that you could perhaps come along and address? I know one of the questions I get asked all the time is, “How do you come up with ideas for these videos?” Well, today’s example is a great one, because my team sent me a note to go and check out the Inbound Marketing Report. Someone in our industry has done the research, and published the findings, and my role is simply to report the findings, and to put my own spin on them, I guess. To put my own flavor, to show you how that’s relevant, to make sense for it. So if you can’t come up with any ideas at all, go out to your industry, have a look at the news, and then report on the news. So there’s one specific strategy. And the news will always generally attack a pain point because research is usually commissioned because they know that the results are going to assist the sales. So a company like HubSpot are going to be showing you why content’s important, and then giving you solutions, the same as I do. I have been using the content marketing channel primarily through the last 18 months and it powers a multimillion-dollar sales machine, just from putting in the effort. To make rich media content, to do podcasts, videos, and text. To have it transcribed, to have it illustrated and put on a website. So there’s three things you can do to make sure that your content is really in tune. Make sure that it is educational and informative and entertaining. Make sure that it is relevant and spot on for your audience. And make sure that it really hits a pain point, because that’s going to generate sales for you. I hope you really liked today’s training. Be sure to comment below, I’m James Schramko, I’ll catch up with you soon for some more training. Spot on. Yeah, I was actually going to ask you your equipment setup for making videos when you travel. Perhaps a video about that? Better yet, a video post linking to an “Equipment” page on this site, which could list which equipment you use in different scenarios?